Obverse: Cross pattée in center within two concentric rings of text. Outer ring text +BHDICTV SIT HOME DNI NRI DEIILV XPI, separated by colons on three stops and single stops. Inner circle text +LVDOVICVS REX. Reverse: Floral of twelve embedded lis, text within and Châtel tournois at centre. Text reads +TVRONVS CIVIS, cits of Tours. History: The Châtel tournois is a representation of the town gate of Tours and the abbey church. 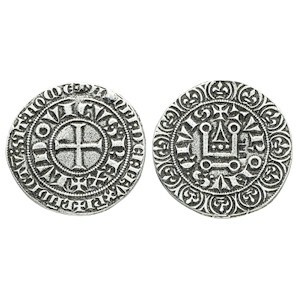 The gros tournois was a coin of medieval France, its acceptability lead to it being widely imitated.